Before designing recipes it is important to know the capacity of your brewing system. 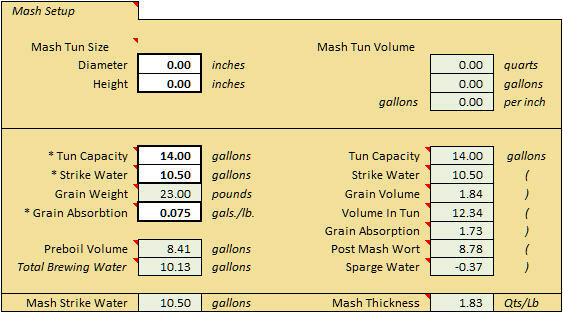 Knowing the maximum volume of a mash tun will help prevent overflows when grains and water are combined. Entering the height and diameter of a vessel is all that is needed to determine its capacity in quarts, gallons, and gallons per inch of height. Start by using one gallon less than the maximum Tun Capacity to allow extra room above the grain bed. Then adjust this volume accordingly based on the results of an actual brew day. Enter the amount of Strike Water used in the mash and target a Mash Thickness in the 1.25 to 2.75 quarts per pound range. The Grain Absorption Rate can vary between 0.125 and 0.075 gallons per pound of grain. Use the lower 0.075 gallons per pound rate when brewing with BIAB and squeezing the grain bag. The Grain Weight is calculated based on the total weight of grain used in a recipe. Grain Space is the calculated volume taken up in the mash tun by the grains when mixed with strike water. Volume In Tun displays the total volume taken up in the mash tun when the grain and strike water are combined and should always be less than the tun capacity to avoid overflow. Grain Absorption is the volume of wort absorbed by the grain that can't be recovered. Post Mash Wort is the volume of wort remaining after the grains are removed. Sparge Water is the volume of water used to rinse the grains to meet the preferred pre-boil wort volume. Enter the boil kettle height and diameter to display the maximum capacity displayed in quarts, gallons, and gallons per inch of height. 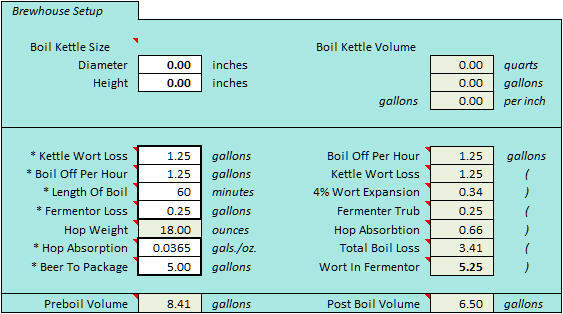 Kettle Wort Loss is the volume of wort that will not make it into the fermentor. This includes volume lost to dead space, hoses, chillers, pumps, hop absorption and boil off. Boil Off Per Hour is the volume of wort lost to evaporation based on brewing system and length of boil. Length Of Boil is the total number of minutes the wort will be boiled. Fermentor Loss is the volume of trub left in the fermenter that will not end up as packaged beer. Hop Absorption is the volume of wort absorbed by hops during the boil. This volume will be lower if squeezing a hop bag or if a hop spider drains wort back into the kettle. A good value to start off with is 0.0365 gallons per ounce of pellet hops and adjust as needed. Beer To Package is the total volume of beer expected to be packaged in bottles, cans or kegs. Wort Expansion is the average volume that wort will expand when boiling. Wort In Fermentor is the volume of wort that will make it into the fermentor including fermentor trub loss. 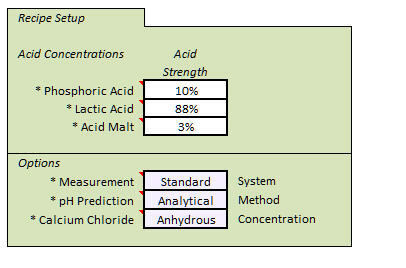 Enter the default concentrations for Phosphorus, Lactic and Acid malt additions here. When designing a recipe the default percentages entered here can be used or overriden with new percentages. The percentages entered on the recipe design page will be saved in the recipe regardless of the defaults entered. The Analytical method uses the color of a grain or its DIpH value to predict mash pH. The Emperical method uses the color of a grain and the thickness of the mash to predict mash pH. This section is for brewers interested in water mineralization and alkalinity and its effect on their beer. A mash ph range of 5.2 to 5.6 is widely accepted as optimal for conversion of starch to sugar. Light colored grains have a natural pH of 5.7 to 5.8 while most municipal water sources have a pH range of 6.5 to 8.5. Mashing light colored grains in untreated municipal water makes it impossible for the mash to be in the optimal 5.2 to 5.6 pH range. An initial water report of your water supply will list its mineral properties, alkalinity, and pH level. Subsequent water reports will list any seasonal variations that occur in your water supply. 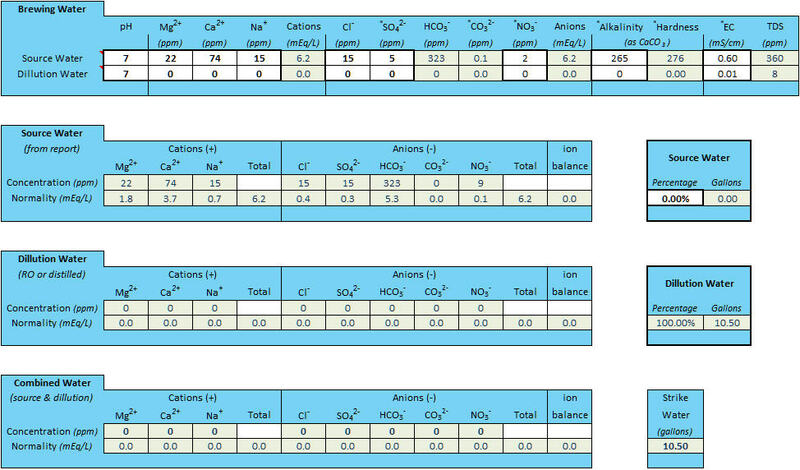 Enter the values listed in a water report as the brewing water Source Water. Distilled or reverse osmosis water should be entered as the brewing water Dilution Water. The alkalinity of the source water can be reduced by blending it as needed with a percentage of dilution water. Using 100% distilled or reverse osmosis water will eliminate seasonal variations and provide a consistent source of low alkalinity water. The mineralization and alkalinity of this water can then be adjusted using salts and acid to match the profile for any style of beer.